With nine lives and a keen taste for catnip, Clarissa will hold your favorite plant. She has nine lives, a keen taste for catnip, and a cute spot for your favorite plant. 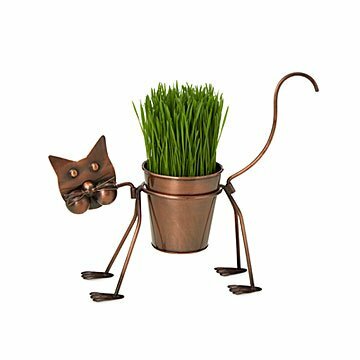 Crafted from recycled iron, Clarissa is ready to receive clay pots of herbs or flowers in frisky feline style. Designed for indoor or outdoor use, she'll prowl onto your porch, stoop, or windowsill. Comes in four pieces with a moveable head and tail—minor assembly required. Handmade by artisans from Moradabad, India. Visit our blog for more on Clarissa and the inspiring local organization that supports the workshop where she's made. Cat Plant Stand: 15" L x 13" H; Pot: 5" Deep x 5" Dia. Everything is great, except the tail doesn't stay in place, but a small bit of jb weld fixed that issue. The display is cute. The tail and the head are not attached. Attaching is very simple, but they do not stay in place. If the wind comes, they are blown into different directions to where you have no idea that the planter is a cat. In order for them to stay, it will have to be super glued or something. Moves out of place from a slight breeze or touched very lightly. Would not recommend. Recipient of gift loved it! This was deeply disappointing, I got it as a gift. They had to use glue and tape to even keep it together. So embarrassing! Don't waste your time. I ordered it as a gift and it came headless. The replacement came headless. This is really cute. It arrived well packaged and was easy to assemble. It makes a great gift. Bought this as a gift and she loved it! Bought this as a birthday gift for my mom, she loves cats. She thought it was such a cute planter and couldn't wait to use it! Clarissa has found her new home! In a Maine Soon household, she fits right in.